Colour makes people! 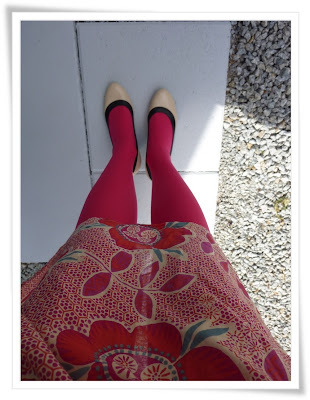 : What I wore Wednesday: colour bonanza! Im linking up with : What I wore Wednesday at the Pleated Poppy. Casual friday at Two Thirty-Five Designs. I love how you combine colours! All very summery, and still warm enough for the Scandinavian summer - that's quite an accomplishment! Lovely! 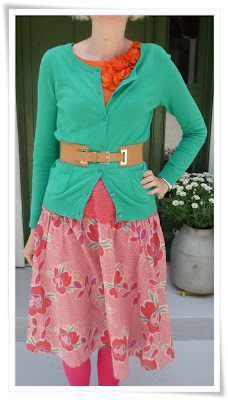 The skirt is so pretty and I like it with the green cardigan. What a great colour combination, Izzy! I'm not surprised to hear you received compliments on it. This is a very sophisticated colour mix (particularly with the neutral belt and shoes). Just stunning! I adore the skirt & the colors-- so sweet~* Love the blog, I'm your newest follower! 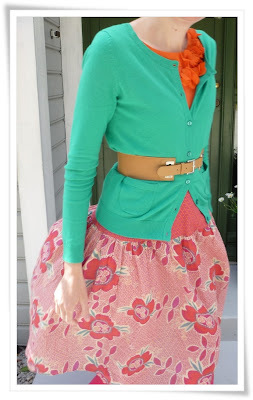 Loving all the colors and the orange floral ruffles peeking from behind the green cardigan is so adorable! Echoing everyone else - this color combo is especially lovely. The orange is an unexpected pop but it works so perfectly.